Whooose birthday is it? Whoooo is turning a year older? This curious and friendly owl seems to say. It is sitting on a leafy branch, under a sky dotted with white clouds. This stylish design is a perfect way to begin your celebration, while the wise old owl, cute as can be, keeps a watchful eye over everything… making sure fun is being had by all. 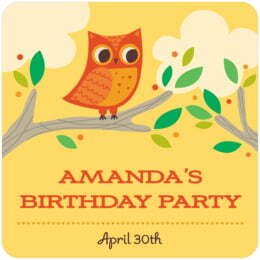 Customize your Woodland Owl kid/teen birthday coasters today to add a memorable element to your birthday celebration! Woodland Owl children's birthday coasters are available in multiple shapes—3.9" round, 3.9" square with rounded corners, and others. They are extra-thick, 58-point paper board. To give you an idea of how thick they are, a stack of a dozen coasters is about 3/4" tall. They are made of absorbent pulpboard to help protect your tabletop. The coaster surface is coated with a smooth matte coating to provide beautiful, crisp printing. 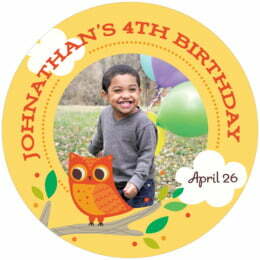 Evermine "Kid" birthday coasters are individually die-cut, so their top has a soft and rounded edge. They are designed to be disposable, but they are durable and re-usable. If unused, they can be set-aside as keepsakes and will last forever. Kid birthday coasters are printed on one side only. On the blank back, a small Evermine logo is tastefully debossed (not printed with ink, but simply pressed into the soft pulpboard paper). Children's birthday coasters come beautifully packaged in boxed sets of a dozen. They are great to give as a surprise gift to a party you are attending (personalized for the party), or if you are the host, hand them out to your guests or scatter them on your tabletops. Just choose a color and shape, and then select "Personalize" to get started!